It's crazy yet organized, minimal yet extravagant and modern yet traditional. This country if filled with juxtaposition, and that's what makes Japan one of my favourites to visit. 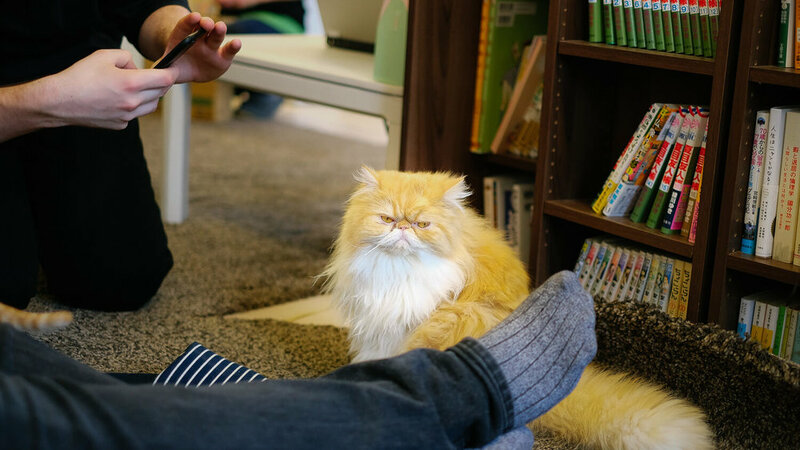 On top of all the visual treats, the Japanese are some of the kindest people I have ever met. We met locals who didn't speak a word of English yet stuck with us to navigate the busy streets until we found our hotel. We also met a couple who sat beside us at a restaurant and ordered us sake to welcome us to their neighbourhood. And then, there was Yoko, who inspired me to make this blog. So yes, we went to Japan to see all the cool modern and weird things, but left remembering how awesome the people were. 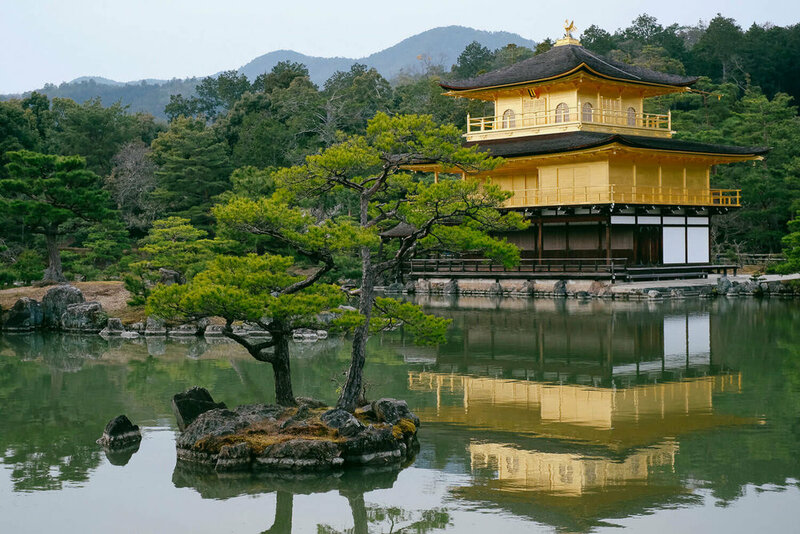 In this guide you’ll find a lot of tips and an itinerary for visiting Tokyo, Osaka, Kyoto and Nara. We paired this with 10 days in Thailand and Siem Reap for an awesome 3 week honeymoon. It aligned with timing for the sumo wrestling tournament. Reversing the order works as well. I went during cherry blossom season so it’s helpful to move northward with the blooming patterns. When visiting Arashiyama, just outside of Kyoto it’s really common to see the bamboo forest. While it was beautiful, it was also overwhelming with the number of tourists. I found the walk to be anything but calming and meditative. 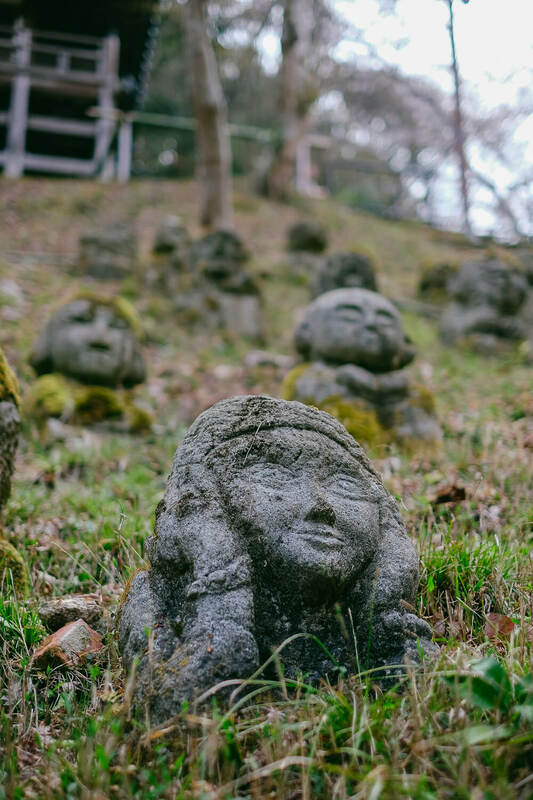 This is why Otagi Nenbutsu-Ji was such a treat. 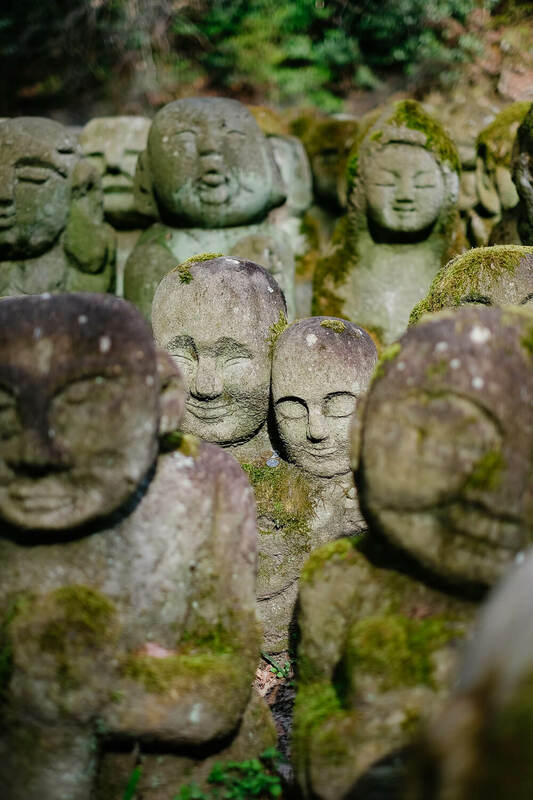 Picture over 1,200 little stone statues, all with different characters surrounding a temple. It was tranquil and frankly - really freakin’ cute. Because it’s further from the bamboo forest it doesn’t get as much foot traffic. We had to take a taxi to get there which resulted in some wonderful and reflective, alone time. 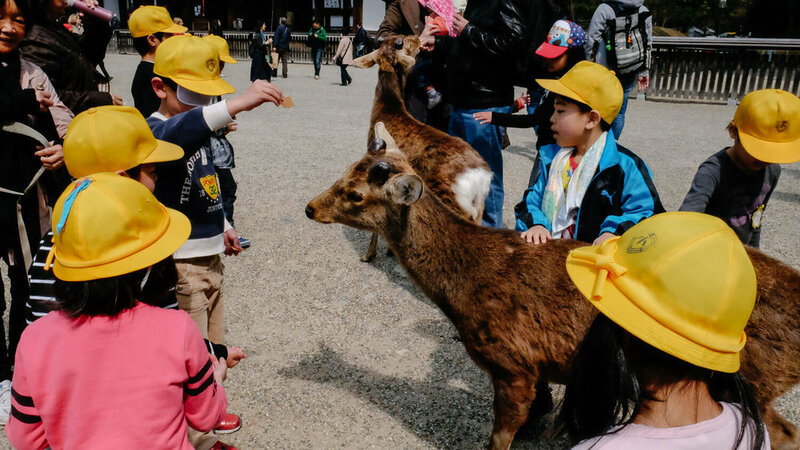 If you’re in Osaka then take a day trip out to Nara. The train ride is just over 30 minutes and when you get there spend the day exploring Nara Park. This city is special because deer roam through it freely. So while you’re visiting the park, temples and shops you’ll likely have a companion by your side. Make your way through the park to visit the Okumura Commemorative Museum (in my above map). There you can learn about earthquakes in Japan and how architects are building new, structurally-sound buildings. You can also try the earthquake simulation machine. Within Nara Park is the beautiful Tōdai-ji temple. A UNESCO World Heritage Site that has a large bronze Buddha. 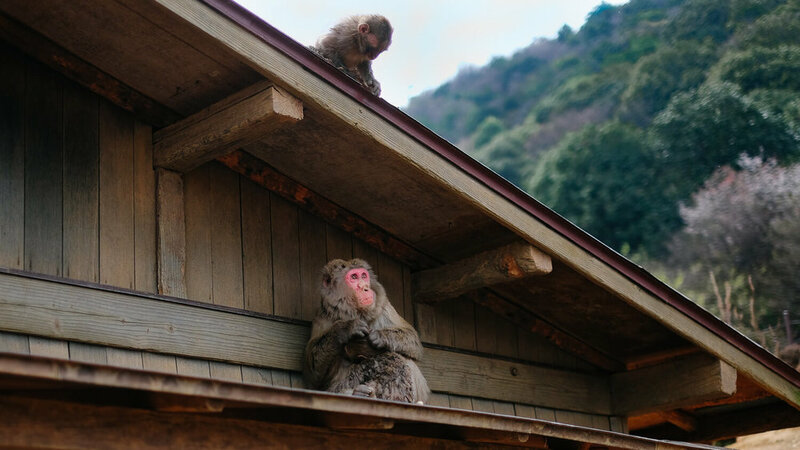 You can also take a walk up to Mount Wakakusa which gives impressive views of the city. Bring a snack, and take in the moment. And maybe, if you're lucky, you'll meet Yoko. If you do please tell her I said hi and show her the site. 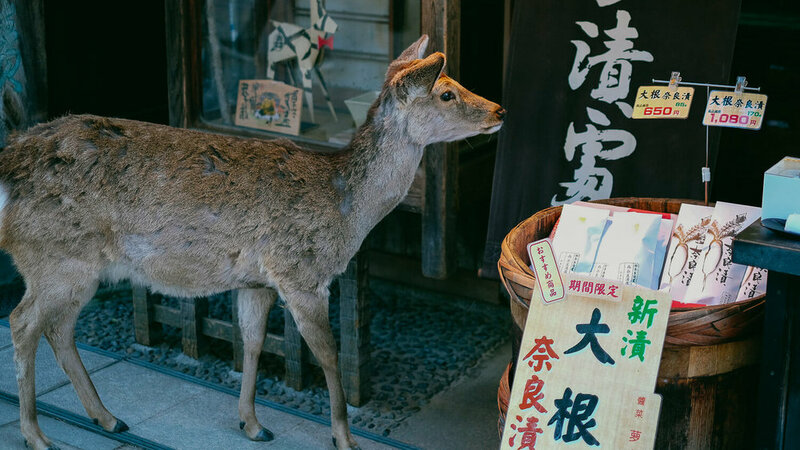 For more ideas, check out this Nara day trip guide. I don’t know about you but I was obsessed with staying in a Ryokan. I really wanted to try the futon beds and having my meals on the floor mats. So I decided to book a ryokan in Kyoto. It felt like the most traditional of the cities we were visiting. We stayed at The Yoshikawa Inn and you can read more about it in the where to stay section below. Needless to say, it was worth every pretty penny. Like the ryokan, I had another obsession, sumo wrestling. I didn’t know much about it, other than the goal is to push your opponent out of the ring. So I made sure that we visited during the Grand Sumo tournament. The tournament happens a few times a year and alternates between Tokyo and Osaka. I based the entire itinerary around this event which is why we started in Osaka. The tickets get you in and out (with limited re-entrances). We showed up at the beginning and the arena was practically empty. We watched several bouts, each only lasting a few minutes or even seconds, then then went for lunch. After lunch it was a whole new atmosphere. The arena was packed. Most of the spectators sat in their boxed sections, many of them brought meals. Things started to get noisy. We couldn’t understand the announcer but it’s easy enough to feel the energy in the arena and go along with it. The last bout clearly didn’t go as expected because at the end, many of the spectators started throwing their cushions on the ring. I have since read that this means the bout was either particularly entertaining or there was a huge upset in the win. Kind of like hockey and the octopus (look it up). Don’t worry if you aren't there for the tournament you can still visit the wrestlers at their numerous training facilities. It’s no surprise that cherry blossom season is peak travel time to Japan. And it’s not only foreign tourists that flock to see the blooms. Japanese from all over the country come to the parks for picnics and Sakura parties under the trees. It’s common to see entire families enjoying meals on large tarps in the park. Though, the season is fleeting and a gamble, my timing paid off. And while the cherry blossoms were stunning and made for striking photos you have to battle swarms of people. For those who don’t do well in crowds - it won’t be an enjoyable experience. Popular viewing spots in Tokyo are Ueno Park, Roppongi Hills. Yoyogi Park, and The Meguro River. 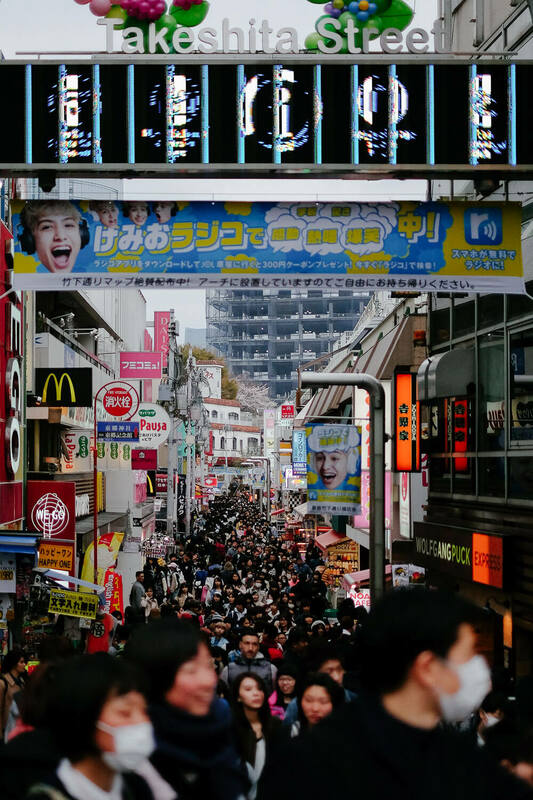 Akihabara is an area filled with massive stores carrying electronics, manga, arcades and maid cafés. While you may not buy anything, it truly is fascinating to wander through stores and see people totally immersed in arcade games. If you’re in the mood for new Fuji gear stop by Yodobashi Camera Multimedia Akiba. They’ve got tons of camera gear, and what’s cooler than buying a Japanese-made Fuji lens in Japan. My personal favourite were the purikura photo booths. We had no idea how to use them so I asked a group of teenage girls to help us out. They spoke no English but laughed at us the entire time we took the pictures. I guess they weren't used to seeing a guy in the booth. Purikura is quite a process. First you take the photos. Then you move into editing. You can add stickers, and edit your features. I’d say it was a success, we were transformed into beautiful little creatures, see proof below! Japan has a vast array of foods to tickle your taste buds. You'll need to master the use of chopsticks, and remember not to stick them upright in your bowl, it's disrespectful. Also, slurping your soup is a compliment, so make all the noise you want. Yakiniku is a type of restaurant where you grill your own meat. General rule of thumb, the more fatty white parts in the meat, the tastier it is. If there's one dessert you need to try in Japan it's the taiyaki. They are little fish shaped waffles with a melted filling. Traditional flavours are red bean or macha but many vendors also have chocolate or vanilla custard. This is one of those rare moments when vanilla is the best. Taiyaki is a fish-shaped waffle filled with custards. A popular street dessert in Japan - just follow your nose. If you're going to splurge in Japan then I suggest splurging on this. A meal is anywhere between 7-14 courses and consists of small plates of local and seasonal dishes. There is normally an amuse-bouche, followed by sushi, seasonal sashimi, vegetables, tempura, soup, grilled fish, palate cleansers, hot pots, rice dishes, and desserts. These can vary in price range, we had ours in Kyoto (reference in above map) and it wasn't cheap but it was delicious and such a unique experience. 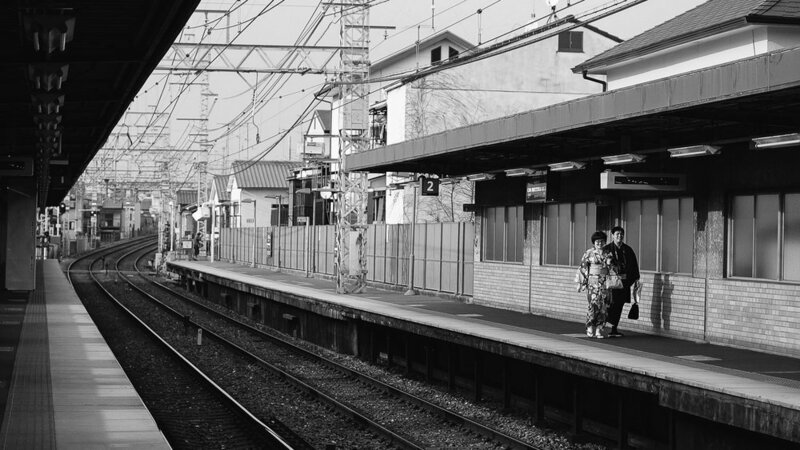 This is a country that operates at maximum efficiency and as a foreigner you can benefit from the Japan Rail Pass. This is the holy grail of rail passes. It's not offered to locals and you want to buy it in your home country, not Japan, to receive a cheaper rate. It gets you substantial discounts when travelling to different cities via the high-speed train plus you can use the JR Yamanote Line for free in Tokyo. This line loops around the city. While you're in the cities everything is either walkable or accessible by bus or subway - which is always on time. The first time you see the Tokyo subway map you might feel overwhelmed but it's easy to figure out, and the Japanese are friendly so ask for help if you need to. If you don’t have much time here’s some top sights to see in a half-day in Tokyo. Japan is amazing for street and architecture photography. The temples and shrines are often packed so arrive early or in the late afternoon for clearer shots. If you plan on shooting the cherry blossoms, timing is always a gamble. Generally the end of March, beginning of April, is when they will bloom. They move North throughout the country, so consider starting your visit in the South and moving with the cherry blossoms. Also, pay close attention to the weather. If the cherry blossoms are in full bloom but there’s high wind or rain on the horizon, make sure you get your shots before that happens. 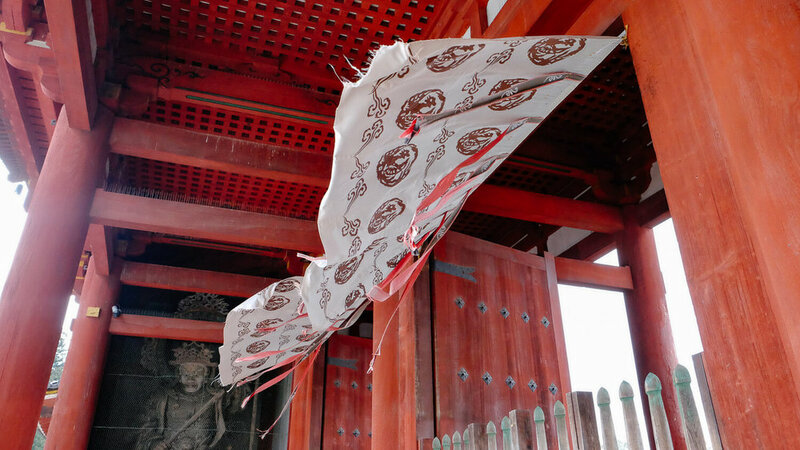 When in Kyoto, be respectful of any Maiko and Geisha. Sometimes, if you’re fast you can catch them hurrying from one building to another, but give them their distance. They’re private people who won’t appreciate a flash in their face. Areas like Shinjuku and Akihabara in Tokyo have bright neon lights so there’s plenty of opportunities for nighttime street photography as well. I found Japan to have the most interesting looking foods. Even the most basic meals had beautiful presentation and the markets always had interesting and exotic things to shoot. Tokyo, is also home to Fujifilm, so if you're a fan, go check out their headquarters in Roppongi or purchase new gear in one of the many electronic shops in Akihabara. Unfortunately there wasn't much in the way of savings, but I nerded out and can say I bought a Fujifilm lens in Tokyo. We stayed in a mixture of hotels and traditional Japanese ryokans. If you can, try to fit a ryokan in your stay. It was such a unique experience, and I still fantasize about my sleep on that futon. Hotel Gracery is located in the busy Shinjuku area. It's a few minute walk to one of the largest train stations in the city and is home to the iconic Godzilla head which is at the top of the hotel. Hotel Unizo was reasonably priced, in a central location of the city and was clean and modern. It felt like a business-traveller hotel. Not a ton of room but perfect for sleeping. Our experience at The Yoshikawa Inn was the best. We never saw other guests. We ate in beautiful private rooms that overlooked a peaceful Japanese garden. They served fresh and seasonal meals, most notably their tempura. They gave use traditional Yukata (cotton robes) to wear for our meals. One of their staff laughed so hard when she came into our room to check on us and noticed that we had put the robes over our clothes. To her, we looked ridiculous. The rooms were comfortable and they had the traditional Japanese wooden bath (ofuro). My favourite part, and I know it's a minor thing, but every time we came back to our room they had folded the tip of the toilet paper so it looked brand new. This attention to detail is why we loved it. Note that all hotels will sell out quickly, sometimes more than 6-months in advance, for cherry blossom season. The prices also increase substantially. A+ No complaints here, this is a great destination for solo female travel. The Japanese have a good grasp of English if you're in the main cities. The brilliant thing is that even if you meet someone who doesn't know English they try really hard to help you anyways. Also, I often used my hotel concierge to reserve restaurants for me. I’ll let you know when new travel guides are live. Thank you for subscribing! I’ll be in touch. Are you an anxious flyer? I asked a pilot 40 questions about flying. Everything from the scary stuff like turbulence to what goes on in the cockpit. Plus: We share our tips for nervous flyers. Explore the city-center and beyond with this 2-day Cusco itinerary and photographic travel guide. Includes tips for planning and acclimating to the high altitude. Use this Sacred Valley itinerary and photographic travel guide to plan your trip. Includes what to see, food to eat and tips for travelling in the region. I’ll share my experience doing the 2-day short Inca trail with Llama Path Sustainable Tours. I’ll go over what to expect, how to pack and give insight into other longer treks. This photographic travel guide will take you through a day visiting Machu Picchu, along with my first-hand experience doing the Huayna Picchu hike. Includes tips on accommodation, transport and tickets. I’ll share my journey from Cusco to Lake Titicaca (Puno) on the Belmond Andean Explorer. I’ll give my honest thoughts on if I think it’s worth the hefty price tag plus outline other transportation options. An honest recap of my experience with the Lake Titicaca tours, with an overnight on Amantani Island. I’ll give tips and detail on what to expect for the Amantani homestay. A travel guide to seeing the Peruvian weavers of Patacancha in the Sacred Valley, near Cusco. They share their techniques and Inca traditions. Plus, I give tips on how to spot synthetic vs. real garments. Explore the desert of Ica and the oasis at Huacachina. Go beyond the typical Huacachina tours. This travel guide offers tips on where to stay and what to see and eat. Savour 8 amazing meals with this New Orleans food blog article. A combination of Southern foods and other great flavours. Bon appétit! Copyright © And Then I Met Yoko. All Rights Reserved. Photography and written content may not be reproduced without permission.